U-G-L-Y, you don't got no alibi, you're ugly. Swap out the cheery tone for angry rage and that sums up the feelings of a maligned Flames fan-base right now. Calgary's special teams haven't been pretty to watch in what's been a miserable week for both units. Shorthanded, they've gone an unfathomable 1-for-3 on the penalty kill in three straight games -- Tuesday's comeback win in Nashville, Wednesday's loss in St. Louis and Friday's loss to Dallas. Now that's a slap in the face. Six power play goals against on nine opportunities? Ouch. You don't need to be a mathematics major to figure out that's a meager 33.3 percent. On the power play, it hasn't been any better. They've gone 0-for-8 while generating only six shots on goal. For nearly 16 minutes, they've had one more skater than the opposition and have barely tested the opposition goaltender. The numbers speak volumes. What a contrast. Opposition: 6 goals on 15 shots in 11:32 of 5-on-4. Needless to say, special teams was the hot topic after a fourth straight setback at home that has left Flames fans spewing venom on social media. 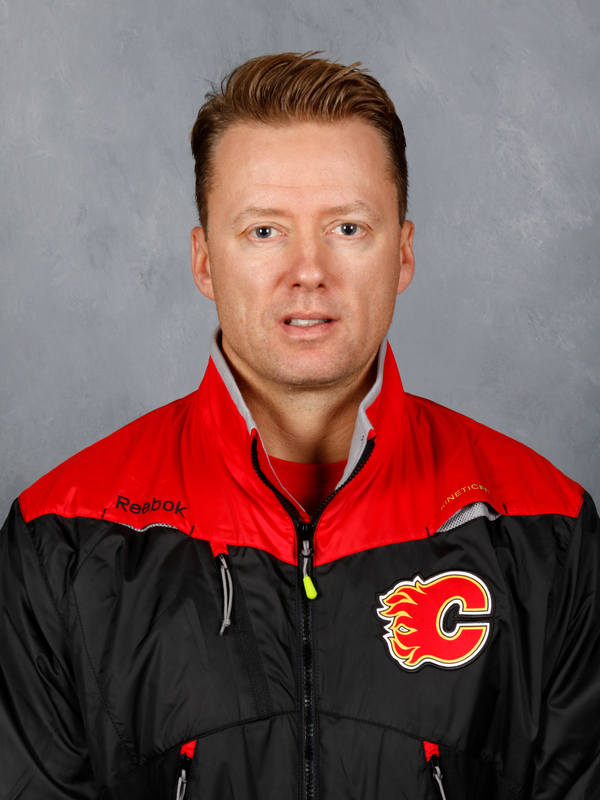 After Friday's game, coach Glen Gulutzan addressed the penalty kill. "We need to get a kill. Three games in a row, we've spotted two goals," says Gulutzan. "My experience with these things is they get mental. You get into patches where you can't keep the puck out of your net like we are in right now," he said. "You need a couple successful ones. You can't go out on the ice every time and oh we're going to get scored on." He says they're not aggressive enough. "We are a little passive. That's what happens when you get scored on too, you get unsure of yourself and you've got to find that mojo back." How do you get better? Typically, it's in the video room. "In the last seven years that I've been in this league, you don't practice penalty kill a lot, you teach it through video and reinforce principles that you want," he explained. "It's a real teaching thing and we're going to have to get back to some of the basics here in some of our sessions and take some extra time." Maybe, expect some personnel changes too. "We might have to introduce some more killers, some guys aren't getting it done," he admitted. What might be required is a hybrid solution with a combination of some new blood and also using existing guys differently. They clearly have to do something. "It's not good enough, obviously," said Mikael Backlund. "We've got to find a way to make it hard on them to enter our zone. When it comes down to it, just bear down and find ways to not let them in." 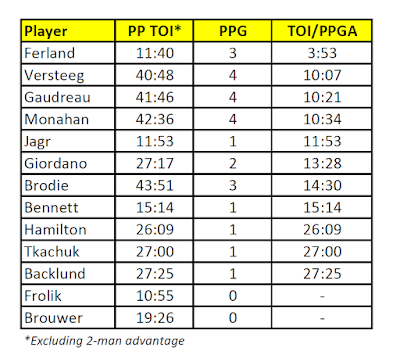 Below is a breakdown of shorthanded ice time and power play goals allowed. Note that this excludes 5-on-3 time as I feel that unfairly skews the data for the players that end up getting scored on in those opportunities where executed correctly, it should always result in a power play goal. While this is oversimplified, as it only reflects goals allowed and not overall scoring chances, it's nonetheless a decent indicator of who is getting the job done, and who isn't. It's obvious that so far, Mark Giordano and Michael Stone have been Gulutzan's No. 1 go-to PK pairing, but should they be? It's that pairing that have been on the ice for all six PP goals allowed this week. Stone has basically picked up where Deryk Engelland left off last season in the role of right-shooting, well-compensated third pairing defenceman, who shoulders extra ice time while shorthanded. It's as if it's the club's way of helping to justify the $3.5 million annually being paid to a player, who otherwise would only play an average of 12 minutes per night. Far more effective has been the pairing of TJ Brodie and Travis Hamonic so perhaps start with them and flip-flop the allocation of minutes. Is part of their effectiveness, comparably, the result of them being a regular pairing at even-strength also? Giordano and Stone, of course, only play together on the PK and not otherwise. 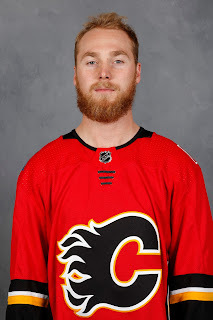 While the sample size is small, fleet-footed Sam Bennett has been the most impactful penalty killer having logged exactly 13 minutes of shorthanded time and only once, having to hang his head and dejectedly skate slowly back to the bench. 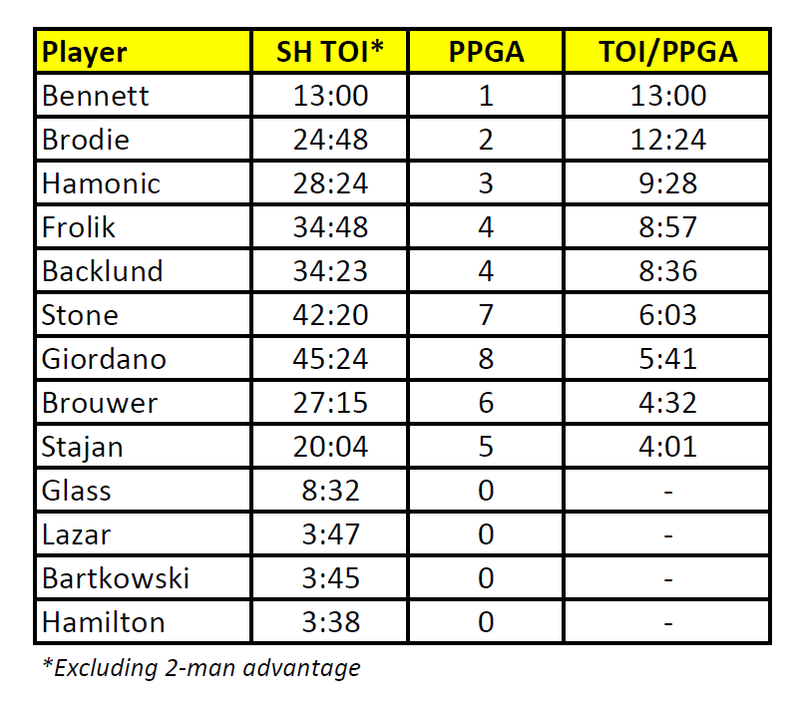 The issue with counting on Bennett as one of your top penalty killers is frequently, he's the guy sitting in the penalty box when the team goes down a man. What should spark the most concern is the ineffectiveness to date of veterans Troy Brouwer and Matt Stajan. Perhaps there isn't enough quickness anymore? Since Gulutzan broached the subject on Friday, who might be candidates? 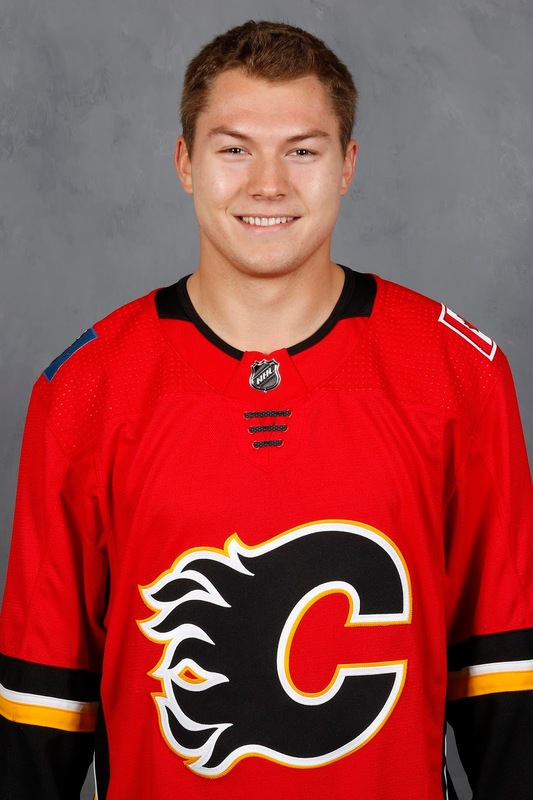 Can Curtis Lazar be taught? It's not new terrain for Lazar, who was used on the PK in Ottawa. In his time with the Senators, he logged 107:33 of time shorthanded, surrendering 16 goals. 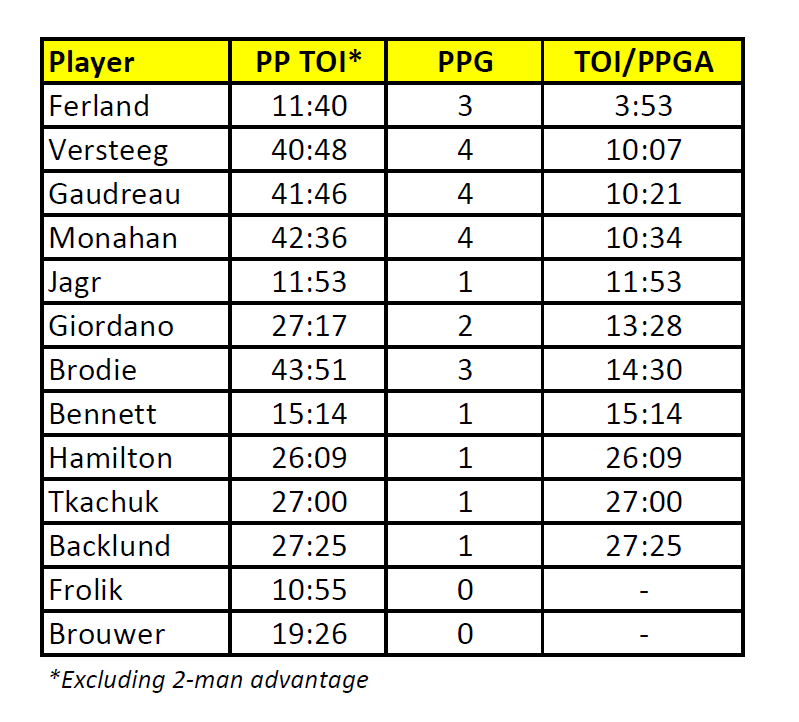 That works out to 6:43 in PK ice time per PPGA, which is pretty much right in the middle of Frolik and Brouwer. Does this open up opportunity for Freddie Hamilton, should he find his way back into the line-up? He's only seen nine minutes of PK time as a Flame in total, but he hasn't yet given up a goal. You'd think he'd have the quickness that would make him another option to consider. Of the young players, Mark Jankowski killed penalties in Stockton but he's still trying to earn the trust of the coach at even-strength, never mind when down a man. On the farm, Garnet Hathaway is a frequent penalty killer. Marek Hrivik is another intriguing option. 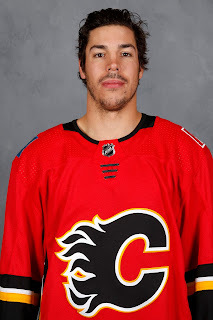 He's an older player at age 26 but he looked good on the PK in the pre-season for Calgary. He's also reportedly played very well for the Heat since returning from injury. Meanwhile, misery loves company as the power play isn't working either. It's not critical that your man advantage score every time, but it is imperative that it at least create pressure and provide momentum. Otherwise, you're creating momentum alright, only for the opposition. "But let's not take any pressure off our power play. Our power play is not generating. We need it to generate," Gulutzan said. Asked if, like the penalty kill, he is open to potentially changing up the personnel on the man advantage, he said always. "You're always looking for ways to get better. Our power play, we're not getting enough pucks to the net. we're not recovering any slop in the slot area when we do get pucks there so we've got to do a better job of that," he said. 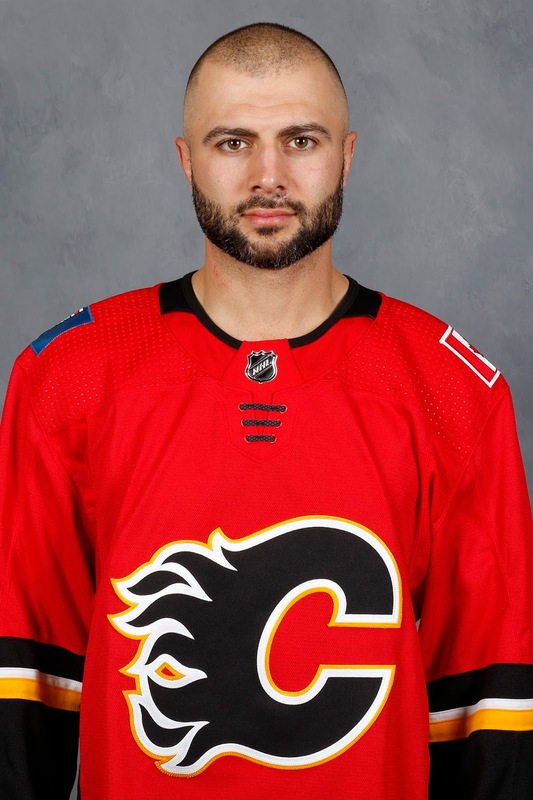 Mark Giordano also weighed in on the scuffling man advantage. "We're out of synch just a touch right now," said the Flames captain. "We'll get a look but we won't sustain any real pressure in the zone, which we need. For whatever reason, we're not breaking in clean enough to get possession. We've got to be better." Asked at what point when a power play is struggling like it is, should the club look at the personnel it's deploying or power play system, Giordano deferred to the decision-makers behind the bench. "Those are coaching decisions, the personnel ones, but if you're out there in those key situations, you have to do a better job and that's the bottom line." In a similar exercise to above, I also examined the allotment of power play ice time and what the production has been. 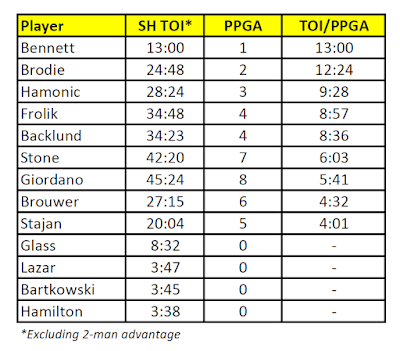 Below is a breakdown of ice time and goals scored while each player was on the ice. Note that once again, this excludes 5-on-3 time to avoid unfairly skewing the data for the players that get the benefit of playing in those manpower situations. Instead, the key here is to level the playing field and see where the production is coming from on the more conventional one-man advantage. Stop me if you've heard this song before. Much like the penalty kill, one of the names that floats to the top when it comes to ineffectiveness thus far is Brouwer. The insistent usage of Brouwer on the man advantage lately is a head scratcher considering that dating back to the end of last season, he's been predominantly playing on the fourth line. If you think about it, it's flat-out weird to have a fourth liner show up on a team's No. 1 power play unit unless it's some sort of Sam Gagner-like power play specialist. Brouwer is not that. In nearly 20 minutes of ice time on the man advantage this season, Brouwer has yet to be on the ice for a goal hug. 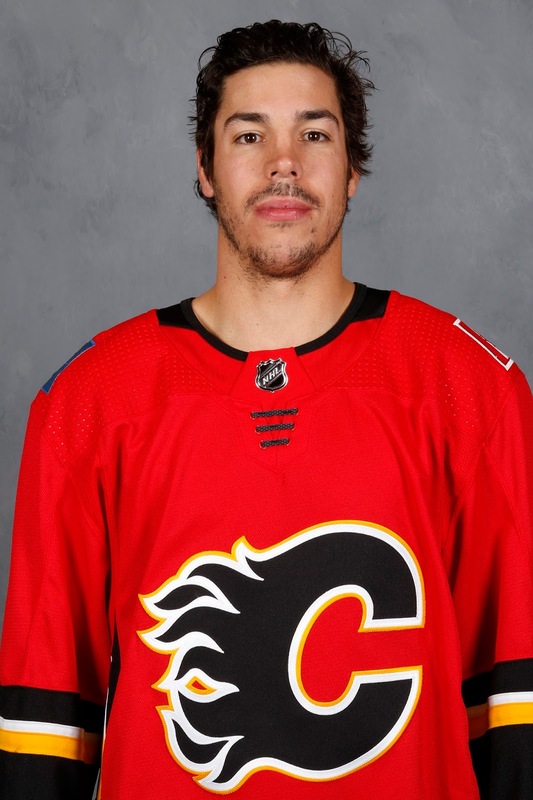 Meanwhile, the other guy whose linemates are on the ice anyway, Micheal Ferland, has been on for three power play goals in under 12 minutes. The role is supposed to be that of a net-front presence, but inevitably, Brouwer ends up handling the puck and inevitably, the play ends up dying on his stick. A bobble, a mishandled pass, a lost puck battle, and down the ice it goes. One of the things that Calgary coveted in Brouwer was a right shot up front on the power play, which had been all left-shots in the past. "In Troy's particular case, he's a right shot. 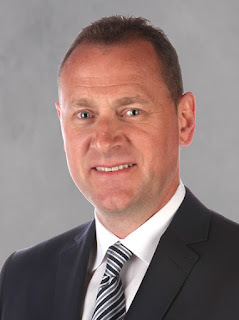 So that opens up opportunities," said general manager Brad Treliving back on July 1, 2016. "You look down the middle and we have four left-shooting centre men. 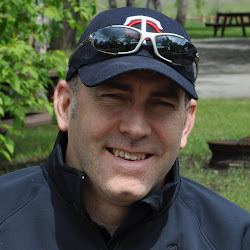 To have the ability to have a right shot on your power play is a completely different look." But for the options that provides, the negatives is the skill you leave on the bench as a result. It doesn't seem like it's worth it. Think square peg in a round hole. The easiest choice is to try Ferland, who had success in his limited time. Plus, that keeps your lines intact. Ferland can also wire the puck and that element is lacking too. When Jaromir Jagr is ready to return, then he becomes another option, especially if he returns to playing on the top line. While on the PK, moving Giordano to the No. 2 unit looks like the smart play, the opposite move seems due on the power play, which should mesh out to a push when it comes to his overall ice time. We know Brodie can distribute the puck, Kris Versteeg can distribute the puck, but neither can shoot the puck -- and yes, I know Brodie did have a couple goals find their way in early in the season. In fact, the lack of a dangerous shot seems glaring on that top unit. At least Giordano can tee it up pretty good and that becomes an additional weapon teams need to guard against. So in the spirit of trying something, or anything, move the Giordano-Hamilton pairing from the No. 2 unit onto the No. 1 unit and drop Brodie and maybe Versteeg to the other unit with Backlund, Matthew Tkachuk and one other player to be determined. More ice time in offensive situations should be a must for Hamilton, who excels at that part of the game. He's just not being used enough stuck on the No. 2 unit. The second unit is where you need to use Bennett. Give him some space, some time, and some quality teammates and let him create. Frolik has great chemistry with Backlund and Tkachuk but I don't see a need to keep the 3M line together on the power play. Backlund-Frolik already are doing the heavy lifting while shorthanded, are already shouldering the most difficult defensive responsibilities at even-strength, there are other options to play on the power play. In fact, for the same wear-and-tear reasons that applies to Frolik, They should also be open to occasionally subbing out Backlund (or Tkachuk) and trying a young guy like Jankowski, who plays the power play all the time in the AHL. Or, insert Ferland on this unit, should Jagr end up on PP1. 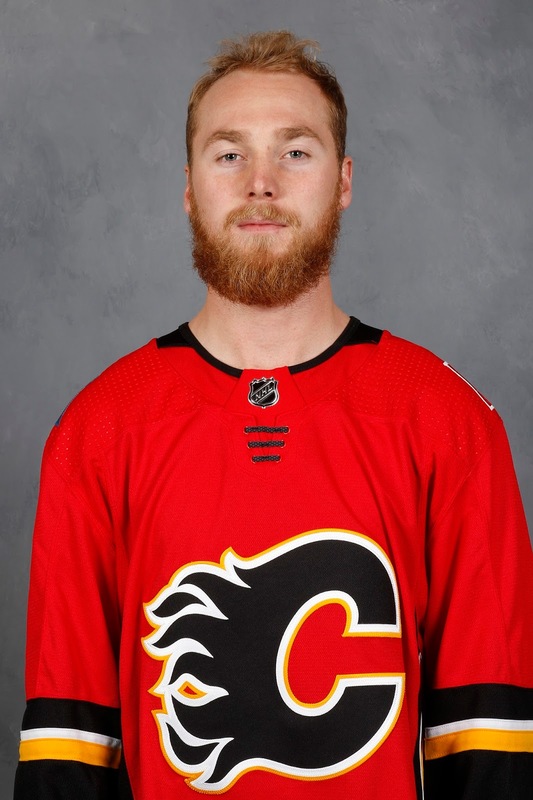 You're not at that point yet, but it's an option down the road in order to flatten ice times and get Jankowski/Ferland more minutes, where he's set up for success, while ensuring Backlund and Frolik are not playing too much, which could impact their more important assignments at five-on-five and on the penalty kill. It really is deja vu all over again for the club's special teams. How soon we forget last season when both Dave Cameron's power play and Paul Jerrard's penalty kill were disasters early, ranking 30th and 28th in the league at the end of November, only for both to turn it around and rank sixth from Dec. 1 onwards. But remaining patient, that's way easier said than done. It's especially hard to do when expectations are so high like they are this year for this team and when it really does feel like the club needs a jolt. Don't be fooled by the Flames' 5-6-0 record, they're fortunate to be that close to .500. If not for the stellar play of Mike Smith, they could very well be record-wise in the exact same situation as a year ago. A seven-game homestand, which Calgary opened up on Friday, provides the luxury of increased practice time and that should be welcomed the way things are going. It also affords the team the ability to break in new personnel in different manpower situations or shift the units around, should they decide it's time to tinker. Either way, the pressure is on Gulutzan to get his special teams turned around. Whether that's staying the course with the personnel he has in place, or mixing it up, he will ultimately be held accountable for what he does, or doesn't do. But with Washington and Pittsburgh the next two visitors to the Saddledome, that u-turn in performance better happen quick. For PK, maybe one unit should be two of the 3M line and another the 3rd member plus Bennett (or Ferland when Bennett is in the box). Then the 3 D pairs can rotate through as well. Familiarity helps. I think that's what your suggesting, sort of? For PP, the first and third lines with Gio and Brodie for one set, and Dougie and Tkachuk for the other set, seem line a possible solution. A 4/1 split (and TJ acts like a forward anyway on the PP) usually works better than a 3/2 split, and again, familiarity helps. That was I think a theme in one of your earlier articles too. Too bad we don't get to make the decisions because almost anything is better than what GG has been sending over the boards on special teams. Maybe it's time for an article on the pluses and minuses of changing coaches mid-year. As you say "deja vu all over again." It sure looks as if the coach has trouble learning from experience. So if GG either can't or won't make at least a few of these changes then how long does BT do nothing? If he does do something are there alternatives to changing the coach? Are the players playing like they want a new coach? GG says something has to change to make the PK and PP better and then what does he do? He plays the same guys in the same position; how does that make any sense. He's the guy in charge and this failure is ultimately his. No one else's he hired his assistants and their failures are his failures. Time for BT to give him his unconditional support for a week and then time to say good bye.